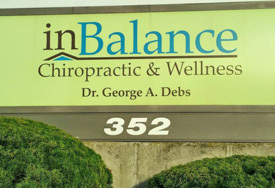 inBalance Chiropractic and Wellness is conveniently located in Shrewsbury. Heading east from White City Plaza, continue on route 9 through the CVS and Walgreens intersection. Continue through the next light. We are 3/4 way up, on the right side of the hill, immediately after Pepperoni Express Pizzeria. Heading west on route 9, proceed through AMF Bowling intersection. At the next intersection, take a right onto Maple Ave and immediately turn left to make a U turn to reverse direction. Continue 3/4 way up, on the right side of the hill. We are located immediately after Pepperoni Express Pizzeria.